Wouldn't It be awesome if our children could honor the many, many, Veterans throughout the great country of America. Well here is our opportunity the touch the hearts of American Veterans everywhere. 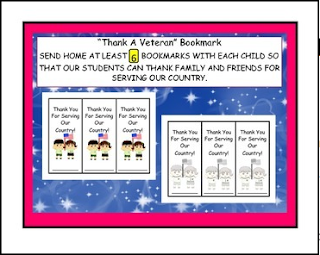 I would encourage you to let each child to take home 6 bookmarks with the assignment of honoring 6 family members or friends who are Veterans. Veterans' hearts will be warmed.